The Heidelberg Laureate Forum invited laureates in mathematics and computer science to participate. There have been numerous comparisons between the mathematicians and the computer scientists. For example, a much larger proportion of Turing Award winners came to the forum than Fields Medal winners. Another difference between winners of the two honors is that Turing Award winners have more interesting academic genealogy. In a previous post I looked at Fields Medal winners whose students or academic siblings also won a Fields Medal. This post asks the same questions of Turing Award winners. To start, while every winner of the Fields Medal has had a PhD degree, 10 out of the 60 Turing Award winners did not have a PhD. 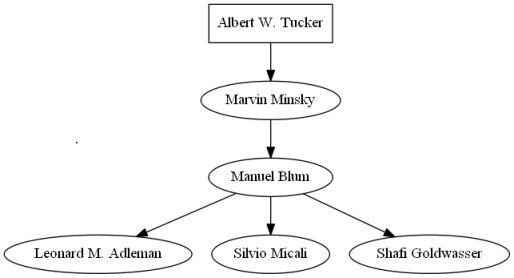 So for many Turing Award winners, the academic genealogy question doesn’t make sense. 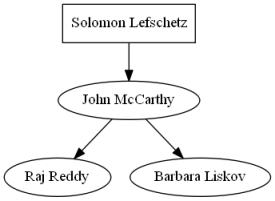 (Academic genealogy typically considers only PhD advisor/student relationships.) But for those Turing winners with PhDs, there are some interesting results illustrated in the graphs below. Turing Award winners are listed in ellipses. Others are listed in squares. Arrows point from advisor to student. 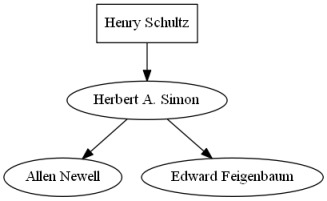 In 1975 Herbert Simon and his student Allen Newell won the Turing Award at the same time. In 1976, Michael Rabin and Dana Scott, both students of Alonzo Church, won the Turing Award. 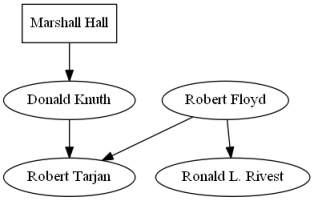 Turing winner Robert Tarjan had two advisors who were also Turing winners. Manuel Blum was the student of a Turing winner and had three students who went on to also be Turing winners. But please tell your webmaster that you have a strange head/title.